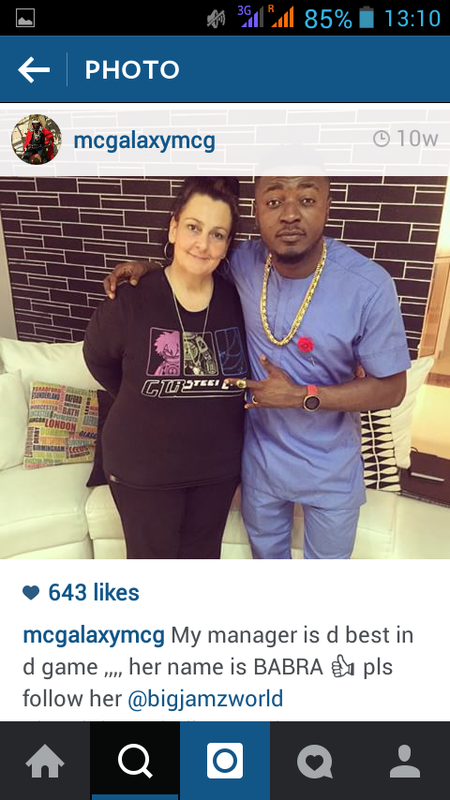 Crooner MC Galaxy who has a tag of allegedly beating up women is at it again and this time the unlucky victim is his expatriate manager BARBARA. According to witnesses who were at Maroko police station in Lekki phase 1 yesterday evening,the sight and bruises on the wrist of Barbara was really bad and galaxy was arrested and detained until early hours of this morning when he was released on bail after he signed an undertaking at the police station that if anything happens to Barbara in Nigeria he will be held responsible. The European lady Barbara works for galaxy as his manager and lives in his house in Lekki with other artists who work on his label. The informant summarises with ''When will Galaxy's wings be clipped cause he had gotten away with too much of abusing and beating up women and every dog should have its day?? Barbara is currently in a sympathisers house recuperating from the shock she suffered in the hands of the musician. MC Galaxy was charged with three count charges of battery and abuse and was to be remanded until the case charged to court but for begging last night.he was released early this morning and is yet to pay three months salary owed her.